This award recognizes the contributions of someone whose interest in and promotion of local arts has served to create a lasting effect in the community. Each year, the Arts Commission board members nominate candidates and select the final recipient. The first was given in 2004. Michael Hughes has been a fixture in the music scene in Danville for his entire life. 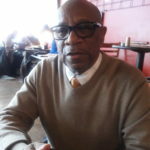 Today he divides his time between performing, serving on the Board of Pioneer Playhouse, conducting and sharing extensive research on the history of African American contributions to the local culture and organizing the Soul of Second Street Festival which includes performances by local musicians and a major history symposium. The Festival celebrates the vibrant life along the Second Street African American Business District near the current location of Constitution Square. Barbara was a local artist who frequently contributed works for exhibits with the Arts Commission and other galleries. Her favorite subjects included horses and her grandchildren. Barbara actively supported the arts in our community as a patron of the Arts Commission programs and the Community Arts Center. Her creative and generous spirit was an inspiration to all who knew her. Barbara passed away on January 14, 2017. The Arts Commission has established the Lockhart Art Is Vital Fund in her honor. The fund will be used for special arts programming in the community. Stuart is a long time supporter of the arts in our community. Through the generosity of the Powell family, many non-profit arts organizations have been able to grow and become stable. His patronage of the Arts Commission, the Weisiger Theater, and the Community Arts Center as well as many other community programs have made this a better place to live and work. In honor of Stuart, the Arts Commission has established the Powell Performing Arts Scholarship which will assist worthy young performers to participate in extra-curricular arts experiences. As Director of Arts Education for the Danville school system since 2000, Jane Dewey has worked to make a more meaningful arts experience for our young people. Dewey coordinates arts events for 5 schools, as well as performing behind the scenes for arts organizations. She has also taught in magnet programs – the Governor’s Scholars’ Program at Centre College and Upward Bound at Berea College – as well as serving as Adjunct Instructor (Drama and Education Departments) and Guest Artist at Centre College, Arts Academy Coordinator and Teaching Artist for Kentucky Center for the Arts, and director of four plays at Centre College, and five plays for the Danville School system. Dewey believes in the power of partnerships to advance the arts, and much of her work is done in collaboration with community visual and performing arts groups, individual artists, and teachers within or outside the district. She works with the Arts Partners of Danville, the Great American Brass Band Festival, Citizens Concerned for Human Relations, the Community Arts Center, West T. Hill Community Theatre, Pioneer Playhouse, the Sister Cities Commission, and The Arts Commission of Danville/Boyle County. She serves on their boards and works on committees. She is past president of the Arts Commission and has coordinated its Youth Art Fair for over five years. After retiring from a thirty year teaching career in Lexington, Stansbury moved to Danville and took initiative as a volunteer at the Community Arts Center and became an integral part of four community choirs. Stansbury created Lunch with the Arts at the Community Arts Center in 2009 and has since coordinated the popular program that offers a diversity of arts disciplines, as regional artists share their specialties each month. In 2010, while Stodghill Professor of Music Dr. Barbara Hall was on sabbatical, Stansbury took on the responsibility of acting director for the Women’s Voices choral group at Centre College. In 2013, she served as interim director for the Presbyterian Church of Danville during their search for a new music director. She also accompanies Danville Children’s Choir and Centre College’s annual music scholarship auditions. She is both a member of Sounding Joy and their assistant conductor and is a member of the Presbyterian Church adult choir. Stansbury is an accomplished classical pianist and a singer, who also continues to be a force in music education for young children through her involvement with the Orff Society, a national organization. Meadows received the award for his work with our community youth in the art of the spoken word. For twenty years, he has been an English, speech and drama teacher at Danville High School. He also coaches the forensics team. Since 1997, the forensics team has won five-state tournament championships, three Kentucky Educational Speech and Drama Association tournaments, and every Kentucky qualifier tournament for the National Catholic Forensics League under his direction. He resurrected the speech team at the Danville High School and has prepared two national champions, eighteen national tournament finalists, and more than 100 national tournament qualifiers since he began teaching in 1994. As an art instructor at Danville and Boyle County Schools, Barbara Reynierson taught middle and high school students. 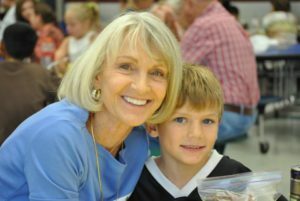 After retiring, she worked with the Gifted and Talented programs in both schools. She is well-remembered by former students for her enthusiasm and willingness to give students the opportunity to try most anything they wanted—an exploration of possibilities. Reynierson is known for her readily shared philosophy that the individual’s original artistic expression should be encouraged, developed, and appreciated at all levels and ages. By nurturing the talents of many students, Reynierson helped shape the character of her community. As a professor of Music at Centre College, Barbara Hall was chosen for her outstanding work as both teacher and conductor of Centre’s choirs since 1980 and for sharing her talents with three community choral groups—Sounding Joy, Summer Singers and the Danville Children’s Choir. Hall was responsible for resurrecting the Children’s Choir that had been disbanded several years earlier. Recently, the choir was one of only two from Kentucky to be invited to the International Choral Festival in Cincinnati. A former president of the Danville-Boyle County Arts Commission, Hall was instrumental in creating the organization’s McKune Arts Scholarship Program, which helps children with financial need participate in extra-curricular arts activities. An avid musician who played mandolin, guitar, fiddle, harmonica, banjo and mountain dulcimer, George Jackson retired from his public school career to become an owner in the Mountain Lodge Motel in Morehead, Kentucky, and work with his wife of 62 years, Rodi, teaching Elderhostel programs about Appalachian culture and music throughout Kentucky and the Southeast. The two became ambassadors for Kentucky music. Hundreds of children were taught how to build a dulcimer out of inexpensive cardboard kits provided by the Jacksons. They taught them old-time songs and helped keep alive those tunes now recognized as standards of music in Eastern Kentucky. After moving to Danville near their family, Rodi and George Jackson continued to teach and inspire this community and all of Kentucky with their love of music. Their musical legacy was recognized with this award posthumously. Logue is the managing director at West T. Hill Community Theatre. Besides serving in this role since 1999, she has directed shows, performed on stage and served in multiple capacities at the theatre. She helped start the Youth Off-Broadway Program and served on the original Danville-Boyle County Arts Commission board of directors in 1998. The first time Logue auditioned for a part in a West T. Hill Community Theatre production, she was not cast. She never gave up, however, and has appeared on stage many times. She mentored under West T. Hill to learn the art of directing. Through Logue, the spirits of the theatre’s founders, West T. and Dorothy Belle Hill, live on. As managing director of the Norton Center for the Arts at Centre College, Foreman is credited for the growing list of national entertainers who have performed at the Norton Center since his arrival in 1983. 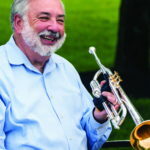 During his 20-year tenure as conductor of the Advocate Messenger Brass Band, the group offered free concerts each summer, made six recordings, and took three international tours. Foreman is a world authority on march music sponsored by newspapers and had one commissioned for the Advocate Messenger. It was his love for marches that led to the creation of the Great American Brass Band Festival, hosted every June since 1989 at Centre College. The festival brings nationally and internationally known brass groups to Danville for admission-free performances. As a community educator, Foreman brought children’s theater productions to the Norton Center for local students and organized brass music history seminars, held as part of Great American Brass Band Festival. He also expanded the presentation of chamber music through the Chamber Music Festival of the Bluegrass at Shaker Village of Pleasant Hill. 2007 Arts Citizen Thomas Baeker, M.D. While practicing oncology is Dr. Baeker’s job, the arts are part of his life. Baeker has provided major support to the arts in Danville. Seeing the need for an agency to serve as liaison between business, government and education sectors in Danville/Boyle County and to act as an advocate for the arts community, Baeker helped form the Arts Commission and served on its board from 1999 to 2001. He was also instrumental in the creation of the Community Arts Center and served on that organization’s board for five years. He has improved the experience of cancer treatment for his patients by introducing the therapeutic value of the arts through exhibit space for local artists as owner of Commonwealth Cancer Center in Danville. For more than fifty years, Charlotte Henson served as the gracious hostess at performances of Danville’s summer stock theater, Pioneer Playhouse. After making sure the food is ready for the night’s guests, she provides live entertainment during the dinner hour. She was the wife and partner of Pioneer Playhouse founder Eben Henson and worked at his side to keep the outdoor theater experience alive for visitors, actors, writers, directors and crew. Since his death in 2004, Charlotte Henson continues to be the creative energy behind Pioneer Playhouse. Her four children have all participated in the theater or other art forms from comedy and movie production to music and writing. As the arts and entertainment editor for the Advocate-Messenger, Jennifer Brummett was recognized for her service to artists and arts organizations in Central Kentucky. At the Arts Journalism Institute at the University of Southern California-Annenberg (sponsored by the National Endowment for the Arts, Brummett was recognized for her ability, dedication, and love of the arts. Before graduating from Centre College in 1993, she began writing arts features as an intern at the Advocate-Messenger, and never left. She raised the community’s awareness of the arts community by featuring local artists, both new and experienced, with her writing and photographs. While an advocate of the arts, she was considered a fair and capable critic as well. Brummett performed in the student orchestra at Centre, took theater classes, and worked backstage during Centre productions. As a volunteer, Wilma Brown led the transformation of the former Federal Building in downtown Danville into the Community Arts Center, which opened in January of 2004. She was one of the primary contributors to the project’s funding and then volunteered to serve as the facility’s first executive director. Brown’s vision was to create an inviting place that would serve people of all ages and backgrounds and would foster economic development downtown. She spearheaded the building’s renovation, met federal guidelines for a public building, and maintained the character of the original building. Prior to taking on the challenge of opening the Arts Center, she was a founding member and first president of the Danville/Boyle County Arts Commission and a founding member of Gathering Artists, a local organization. After retiring as a librarian in the public schools, she has been a watercolor portrait artist, gallery owner, appears on Kentucky Education Television as a book reviewer. Also a culinary artist, Brown owns a small bake shop that serves pies and cookies.